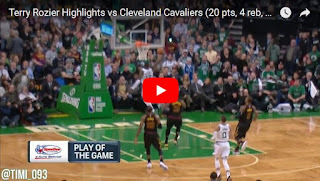 Terry Rozier scored game high 20 points in just 20 minutes of play as the Celtics beat the Cavs to finish the first half of the season with 31-10 record. It was fifth straight double-digits game for T-Ro. Jayson Tatum added 15 points on the night while Jaylen Brown posted 14 points to go with eight boards and four assists. Marcus Smart got 15 points on his own, including 3-for-6 shooting from behind the 3-point line. Kyrie Irving and Al Horford both scored 11 points and they both were just one rebound away from a double-double. Irving also dished out six assists, doing pretty good job on Cavs defense that double-teamed him pretty much all night.